A departure from food: beading bonanza! My cousin got me some wire, combination pliers and some seed beads as a Christmas present when I was 12 years old, and I’ve been a beader ever since. My first job out of school was as a jeweller, during which time I got a qualification in design and manufacture of fine jewellery, but I’ve always preferred cheap and cheerful, there’s so much more scope for grand sparkle and it’s so much less catastrophic if anything goes wrong! Like many of my hobbies, it waxes and wanes. A few years ago I started teaching some simple projects as Adult Learners’ Week courses. 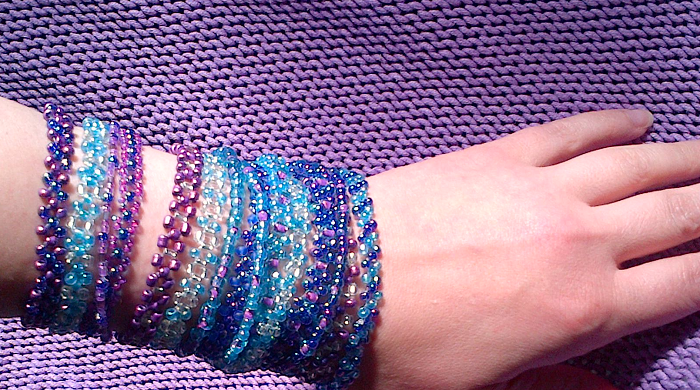 I picked a design, broke it down into stages, purchased a lot of wire and beads in bulk (so much cheaper, as always!) and most of the people who came to my classes left with something wearable, which was quite pleasing when a lot had arrived proclaiming their supposed lack of skill. This year I was recovering from surgery during the Adult Learners’ week and unable to deliver any classes, however I still have many kilos of beads left from previous years. I decided to make some quick bits and pieces to get my hand back in (I’m always meaning to make decorations for winter fairs, and then never quite getting round to it) so I made some earrings, some rings, a couple of necklaces. Then I started making some simple friendship-type bracelets and once started I kept thinking of different colour combinations I wanted to try. These are just one series (in my favourite colours) and I’ve made a couple more since I took this picture yesterday! Oh, these are lovely. I bead, too, but I’ve taken a break for the last two years. I miss it. I also love what you said about “cheap and cheerful” and “so much more scope for grand sparkle and it’s so much less catastrophic if anything goes wrong!” I totally agree! This story about an expensive necklace has haunted me since I read it in middle school: http://americanliterature.com/author/guy-de-maupassant/short-story/the-necklace. Leicester Vegan Fair 2015 is coming soon! Home-made soya yoghurt the lazy way. Hospital food’s not so bad, if you’re in the right hospital!